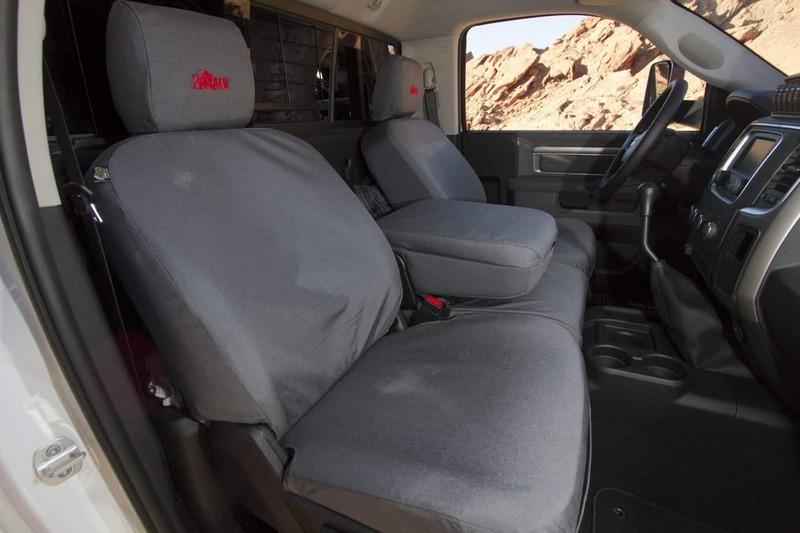 With 15 years of experience producing Wrangler products, American Expedition Vehicles (AEV) has prided themselves on being a “Jeep” company, one that specializes in components that are engineered to work in concert with each other. Their objective has been to provide the enthusiast with a one-stop source for the highest quality parts—rather than having to patch your rig together with products that may or may not be the best match. This year they’ve deviated from the Jeep only mantra with the introduction of a new line of innovative products for Ram full-sized trucks. That line culminated in the development of the example of automotive art before you, the AEV Ram Ute. 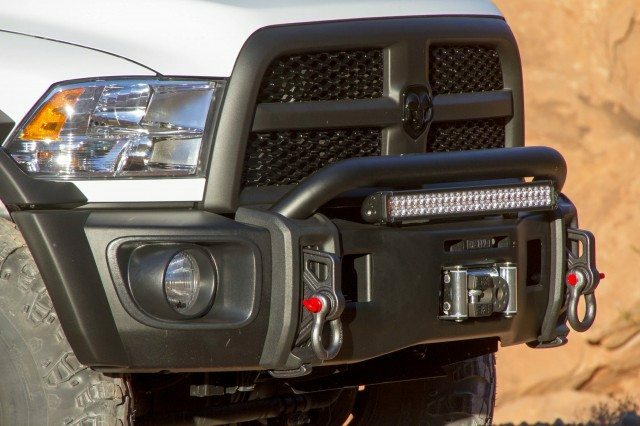 AEV’s front bumper is a modular design, stamped from 3/16-inch plate steel, and fits flat or front mount winches. 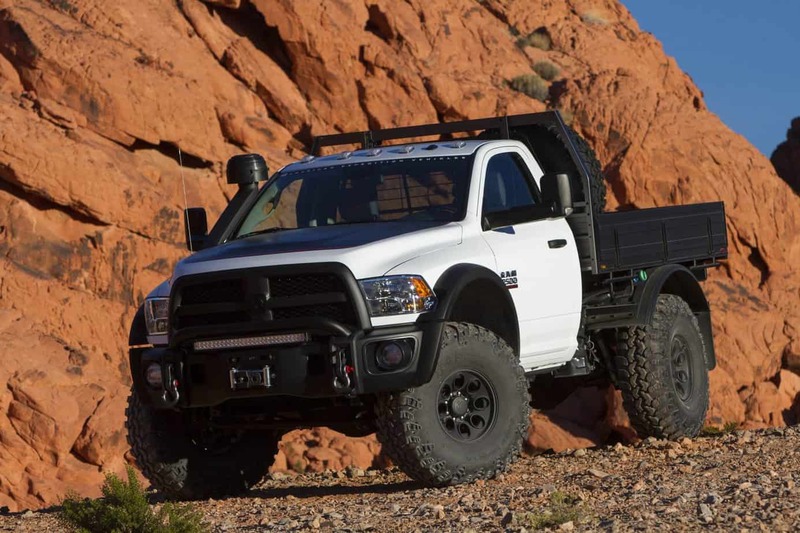 The Ram features a 16.5ti Warn winch fitted with an AEV/Factor 55 FlatLink thimble. Front recovery points are cast steel and incorporate a small skid pad at the bottom. Modular bumper ends house either AEV/Vision X 50-watt LED lights or the OE units. The front bumper incorporates a unique “air funnel” to provide proper circulation to the transmission cooler. On initial glance, the Ram Ute appears like any other lifted truck with a cool bumper and big tires. However, closer inspection reveals a plethora of nuances that separate it from the Bigfoot crowd. The first to mention is that though it rides on 41-inch Interco IROK Super Swamper tires, the Ram really isn’t that high. 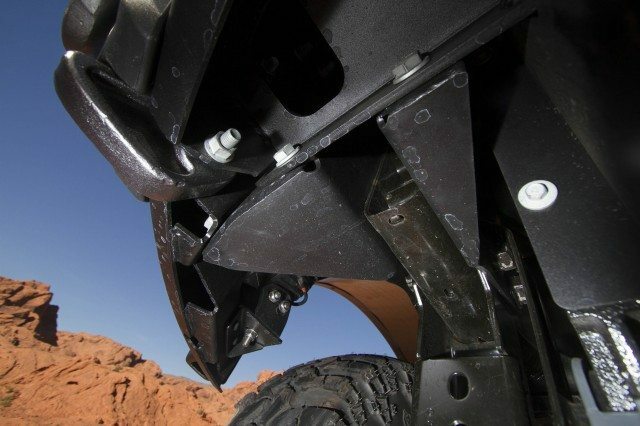 In fact, the suspension system raises the vehicle a mere 3 inches. 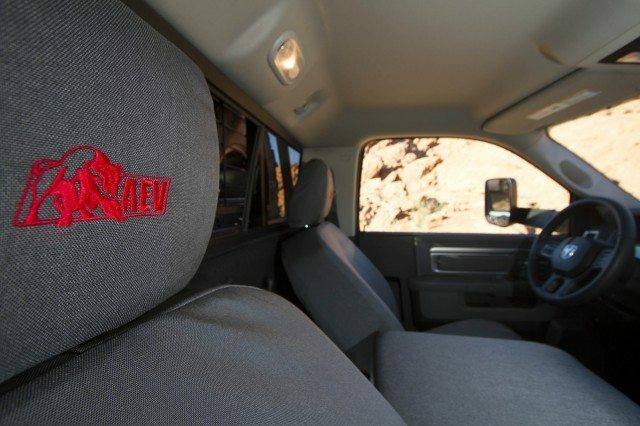 The interior is cleanly appointed with AEV’s Ram Cordura seat covers. 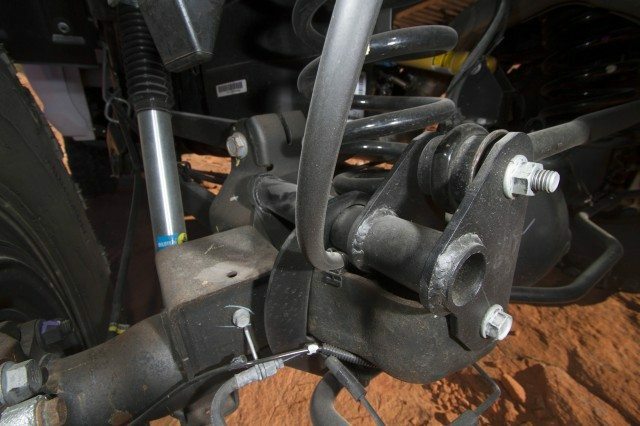 A special bracket repositions the OE trailing arms 3 inches lower and 1.5 inches forward. The 11.5-inch AAM rear axle was fitted with an ARB air locker and 4.10:1 gears. 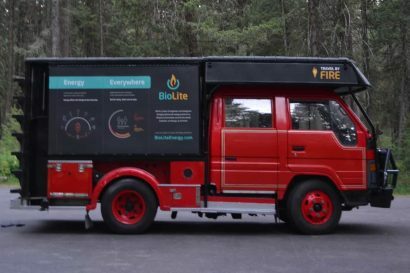 The spare tire was removed in lieu of a 30-gallon Titan auxiliary fuel cell. 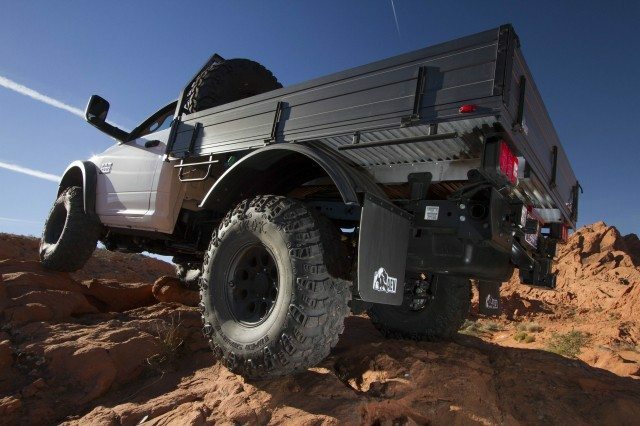 The rear suspension integrates a sway bar and panhard bar correction brackets, stock length coil springs, and AEV spec Bilstein shocks. 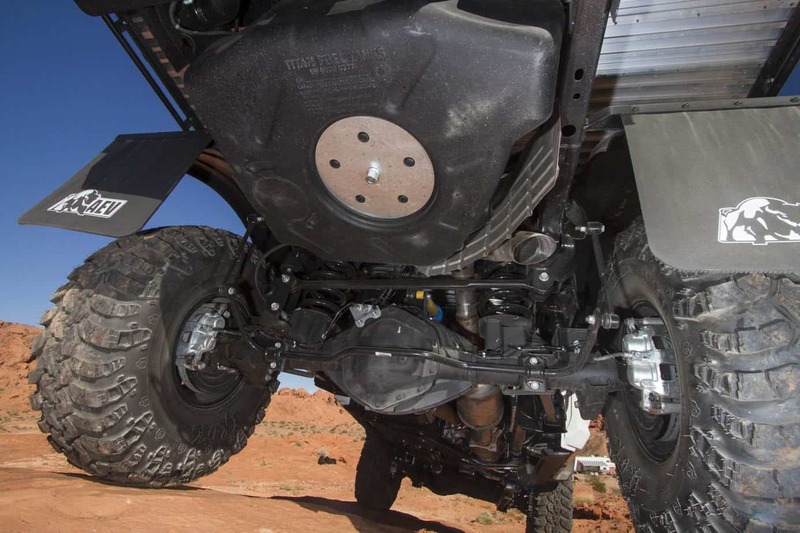 The front features AEV’s DualSport 3-inch suspension and Hi-Steer kit, which maintain factory steering geometry. 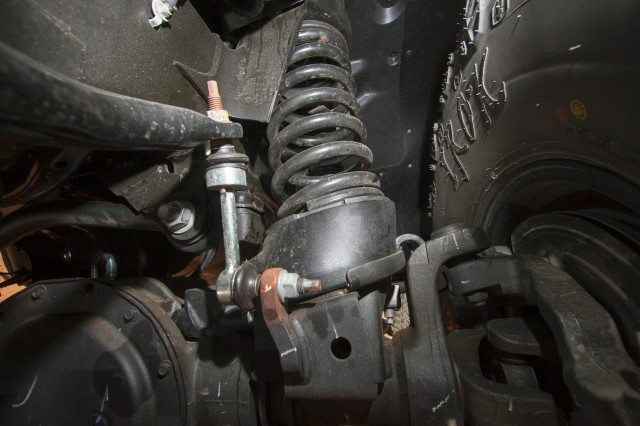 A proper suspension system is engineered to closely mirror the OE handling characteristics, and AEV accomplishes this through a number of innovative measures. While most lift kits incorporate a drop Pitman arm or steering link, the Ram DualSport system utilizes a custom bracket on the axle that raises the panhard rod to maintain its original geometry. While the OE steering arm attaches to the bottom of the knuckle, the new AEV arm attaches to the top, again retaining the factory geometry. 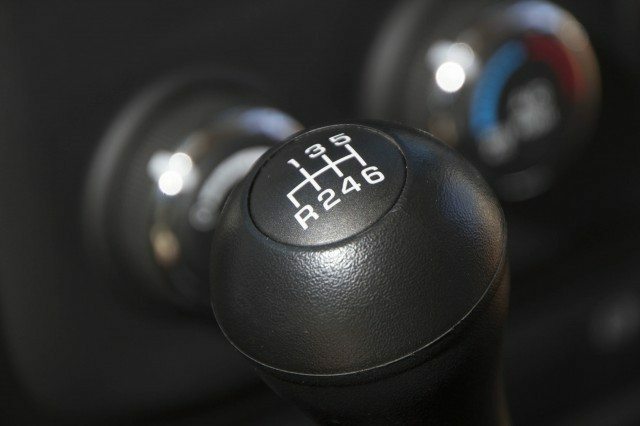 Rather than increasing the spring length, which can lead to unusual steering characteristics during full droop, a 3-inch cast aluminum seat is placed under the OE coil springs. The aluminum aspect keeps unsprung weight to a minimum, and the stock spring length allows the steering to track properly under any axle configuration. 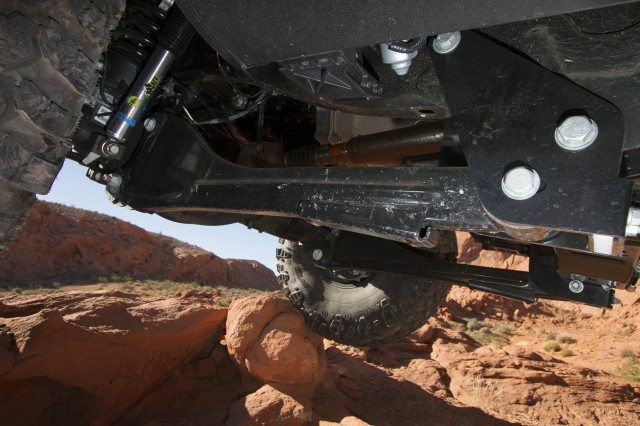 The system incorporates the OE trailing arms, but a custom rear bracket positions the rear of the arm 3 inches lower (again, proper geometry) and 1.5 inches forward to allow for tire clearance. 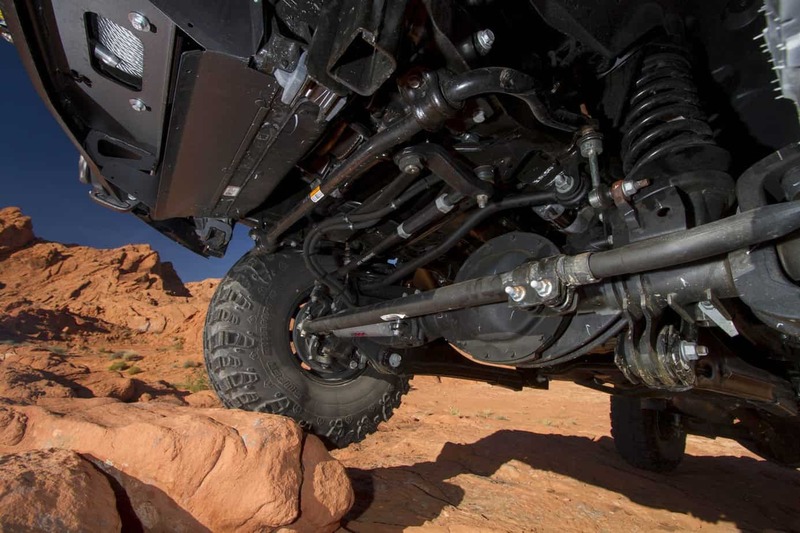 To assist with maneuvering the 41-inch tires, a PSC hydraulic ram was added. 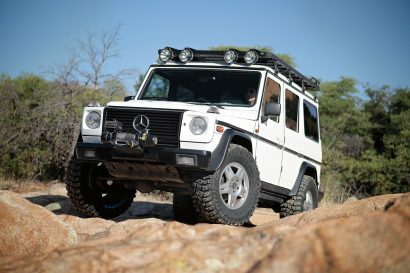 The rear suspension integrates a similar combination as the front: sway and panhard bar correction, stock length coil springs, and AEV spec Bilstein shocks are found at each corner. The result is increased ground clearance, an additional inch of up travel, larger tires that don’t rub, and a vehicle that maintains stock handling properties. 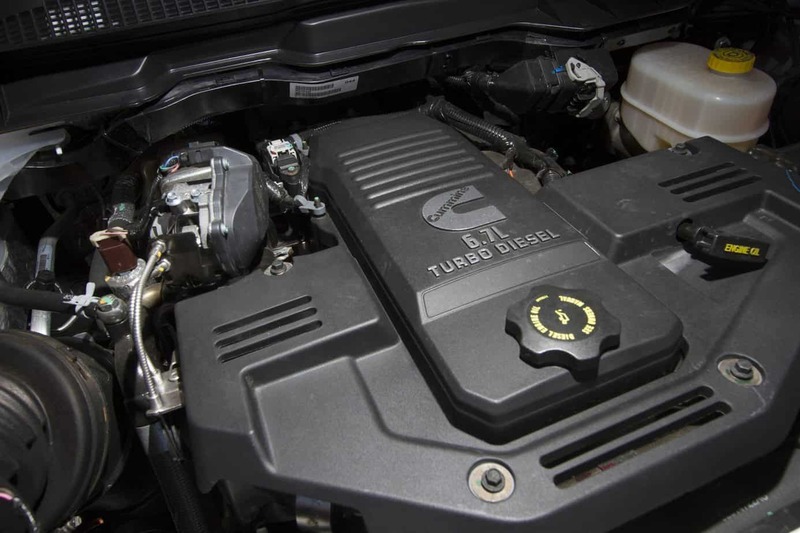 The Cummins 6.7L turbo-diesel, which generates 650 horsepower and 660 lb-ft torque, was left alone. Keeping with the don’t-mess-with-a-good-thing mantra on this build, AEV left the powertrain pretty much stock. 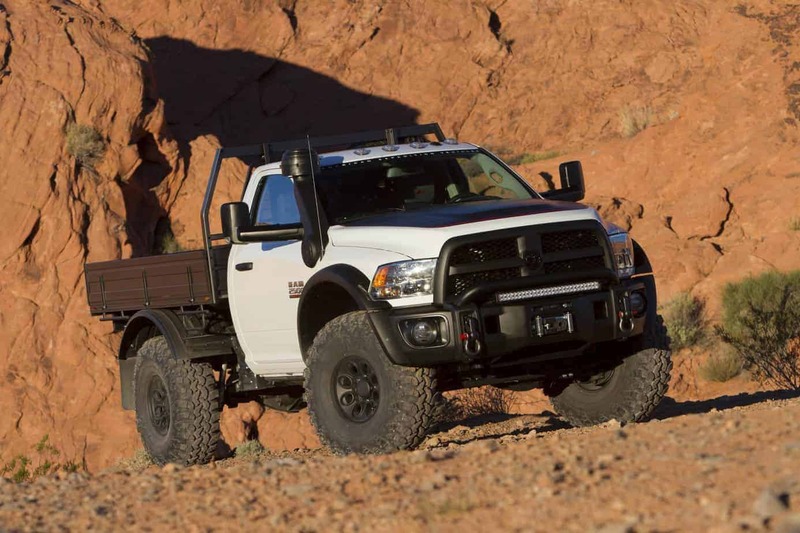 The Cummins 6.7-liter turbo diesel generates 650 horsepower and 660 lb-ft torque, more than enough to motivate the vehicle’s weight. The G-56 6-speed manual transmission (a wonderful thing) features an impressively low 6.29:1 first gear and .74:1 overdrive ratios. To ensure debris-free air to the engine, an AEV Raised Air Intake system was added. It functions as a pre-filter for the OE air filter, is self-cleaning, and utilizes a cartridge similar to those found in heavy equipment and military applications. 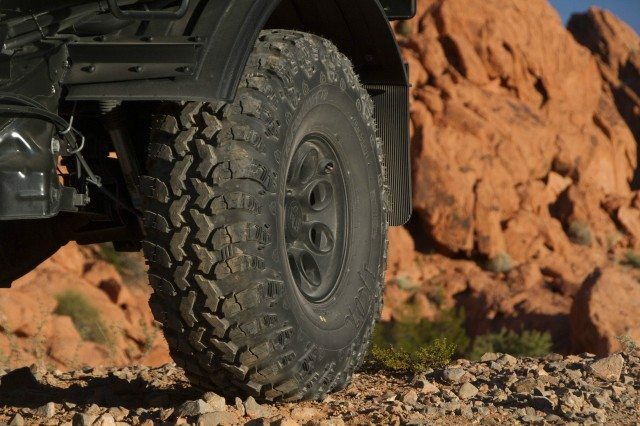 To compensate for the 41-inch tires and provide four-wheel traction, the factory axle housings (AAM 9.5-inch front and AAM 11.5-inch rear) were fitted with 4.10:1 ring and pinion gears and ARB air lockers. 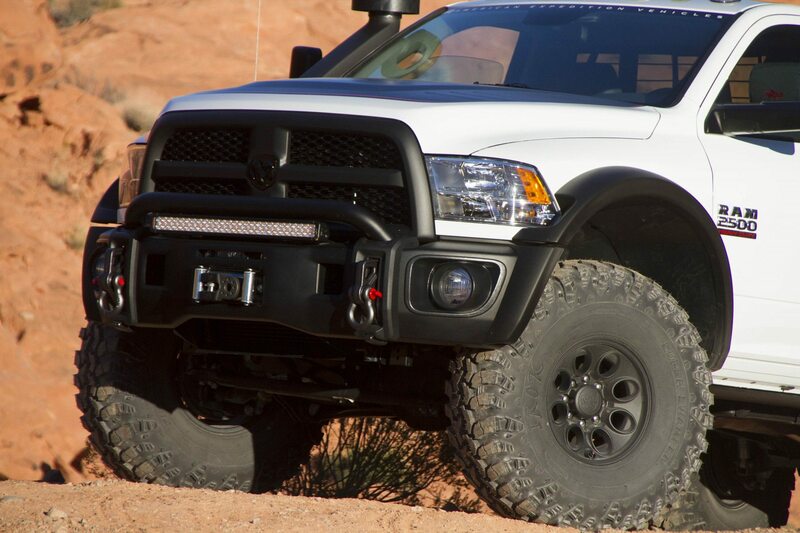 AEV made a splash at the 2013 SEMA show with a prototype Ram front bumper, and brand enthusiasts united in interest. We’re pretty sure they won’t be disappointed with the final version. As with many of the company’s bumpers, it is stamped from a solid sheet of 3/16-inch plate steel. Frame mounts are 1/4-inch plate and trace the frame rearward beyond the stock fittings on the end of the frame horns. Our experience has shown that this method addresses the torsional effect induced during heavy winching by distributing the load evenly to the meat of the frame. Though the winch cradle is designed for a Warn 16,500-pound model, it will accommodate forward or bottom-mount units. Recovery points (or hoops) are cast steel, feature a nifty little skid pad, and sit outbound of the frame. To properly distribute the load experienced during a recovery, AEV engineers developed a triangulated box-type system that creates a load path to the main mount and frame; all are 1/4-inch steel. The bumper is also of a modular design, which will allow end-users to choose from a variety of lighting and riser hoop options. Another feature to mention, and one many bumper fabricators are overlooking on this vehicle, is the engine’s intercooler. It rides directly behind the OE bumper (which has a cutaway to allow airflow) and needs that cooling effect to function properly. 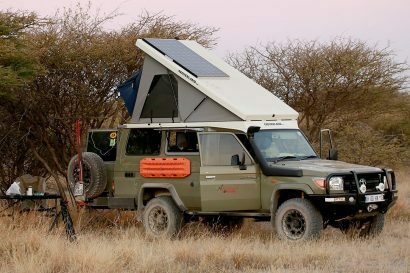 The AEV unit addresses this with a cooler-width funnel underneath to allow for unrestricted airflow—though I personally might add an expanded-metal screen to protect it from rock damage. The aluminum tray bed is from Ute Ltd. in Australia. 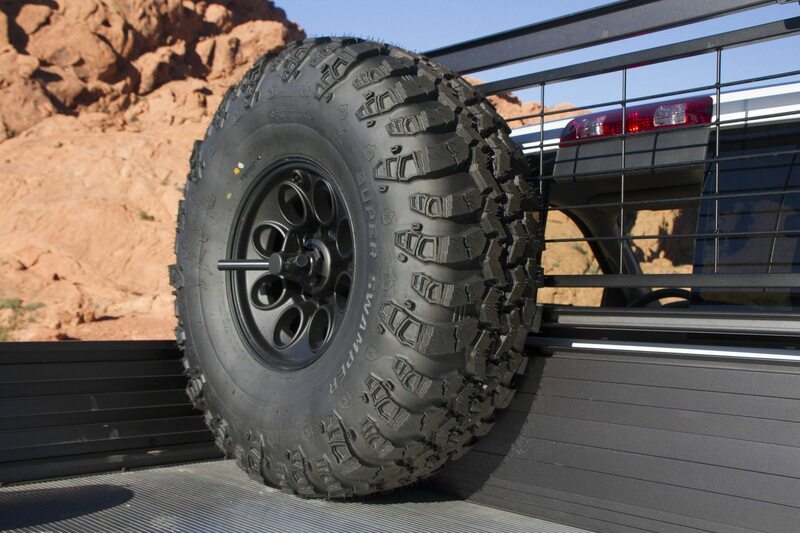 AEV fabricated custom wheel wells to accommodate a set of 41-inch Interco IROK Super Swamper tires. Out back, the Ram was treated to an aluminum, Aussie-style tray bed from Ute Ltd. 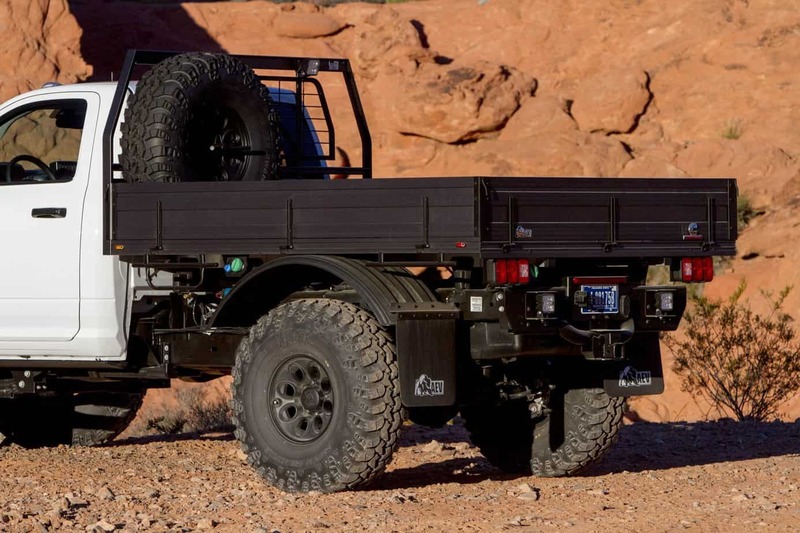 Though it’s 7 feet in width, a bit wider than the truck’s body, it provides ample room for gear and offers the ideal platform for a Four Wheel Camper or other abode. The stock rear bumper was exchanged for a 1/4-inch plate steel unit with integrated LED lighting, trailer wiring, and a 2-inch receiver. The filler for a Titan 30-gallon auxiliary fuel cell, which hangs in the spare tire bay, sets between the bumper and bed. The spare was remounted against the front of the bed with an AEV tire carrier kit. 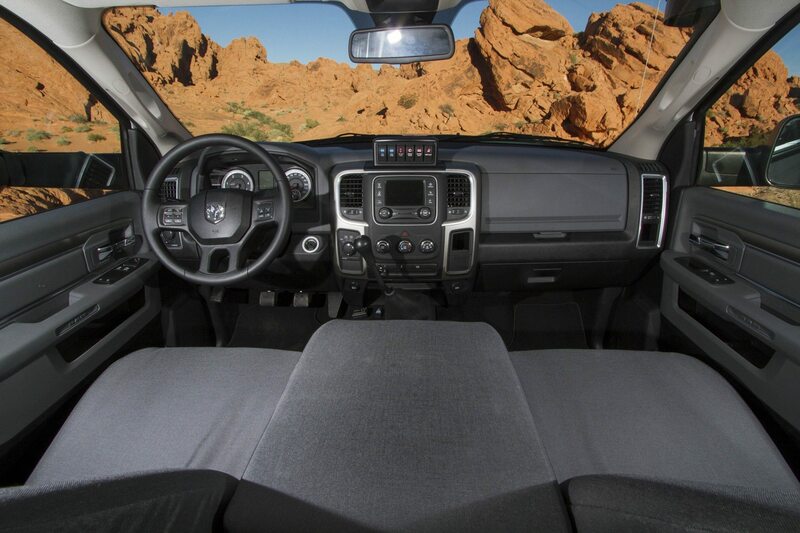 We were jazzed when we hooked up with Dave at the 2014 SEMA show and he offered us first crack at reviewing the Ram Ute. 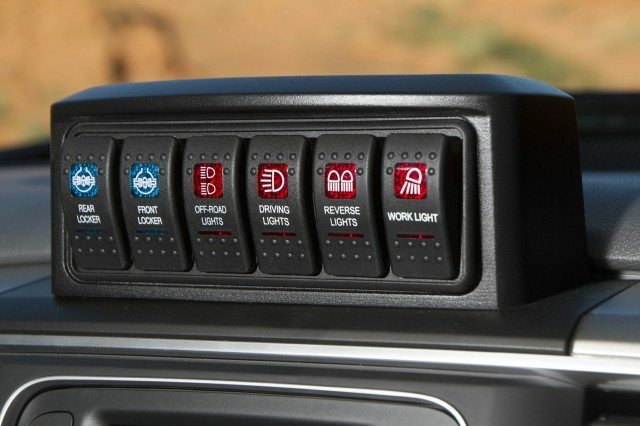 Whether you are a Jeep, Toyota, or Land Rover aficionado, you’ve got to admit, it’s downright cool. 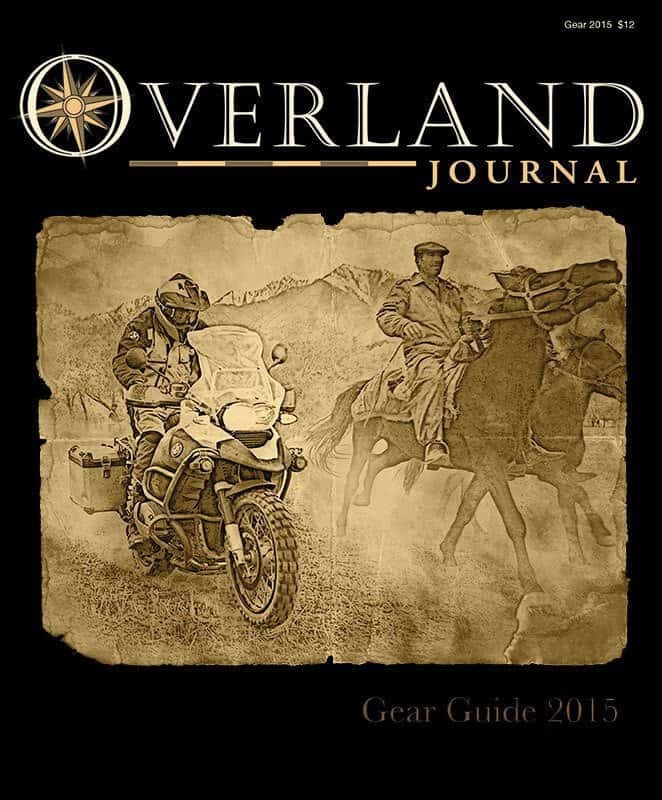 This feature first appeared in the Overland Journal Gear 2015 issue.